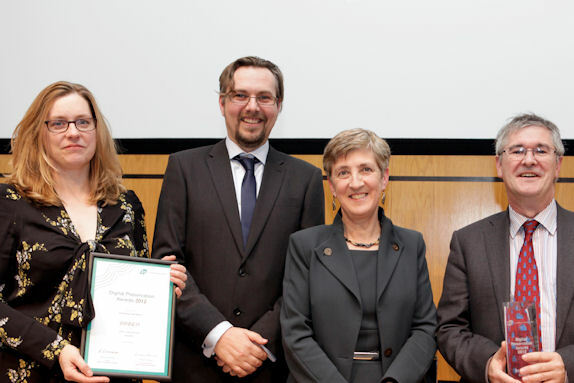 As part of its tenth anniversary celebrations, the Digital Preservation Coalition (DPC) awarded its Decennial Award, for an outstanding contribution to digital preservation, to the Archaeology Data Service. We beat off intense competition from Library of Congress, the National Archives, and the International Internet Preservation Consortium, to take the award at a ceremony at the Wellcome Collection in London on December the 3rd. The Decennial Prize – the DPC’s most prestigious – is awarded specially to mark the tenth anniversary of the founding of the DPC. It recognises the most outstanding work over the decade that the DPC has existed. After a painstaking assessment, an expert panel selected finalists from New York, Washington and London as well as York. In July, ADS also received the British Archaeological Award for Best Archaeological Innovation of 2012 in recognition of technical innovations it developed which allowed thousands of hitherto unpublished fieldwork reports to be made freely available online to any user. DPC Decadal Award Nomination: ADS short listed amongst esteemed company. The announcement of the Digital Preservation Coalition (DPC) awards shortlist is always greeted with some excitement the digital community, but this year’s list was particularly well received here as the ADS due to our short listing in the ‘outstanding contribution to digital preservation in the last decade’ category. To be listed in such esteemed company as the International Internet Preservation Consortium, The PREMIS Metadata Working Group and The National Archives is an honour which reflects the hard work being carried out here at the ADS over the last 15 years. At the same time the nomination of subject specific data centre, the only one listed in the 2012 list, should be considered a tribute to the forward thinking attitude in archaeology and heritage management generally which places the discipline at the forefront on digital technology.